Want to be an Early Adopter of the New Lightning Flow Builder? Welcome Aboard! In the aforementioned articles, I have discussed the new Lightning Flow designer tool – introduced by Salesforce in Spring’19 release and some basics concepts of Flow – to help you better understand the elements of a flow designer. If you didn’t get a chance to read it yet, do it now! It will significantly improve your knowledge of Lightning Flow. 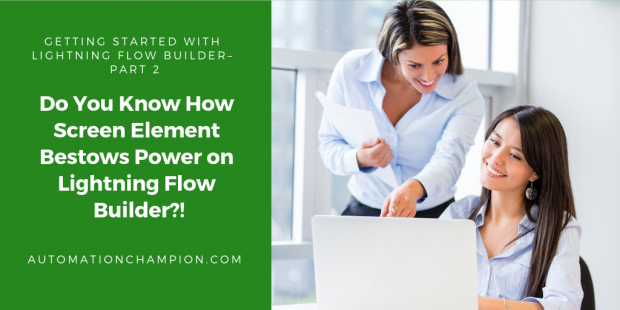 Once you master the art of leveraging Lightning Flow, you will be able to easily create an optimized flow! What is a Screen Element? What is the purpose of a Screen Element? How to create a Screen Element? Explore different ways to call Flow with Screen Element. A Screen Element bestows power on Lightning Flow by making it more robust compared to the Lightning Process Builder. You might be thinking how and why? Let’s see through a business use case. Later Edward has to put this form on the Home Page Layout and open it for the entire world. If you are a Salesforce Developer, who knows how to create a Lightning Component, fulfilling the above requirement would be a piece of cake for you. But if you don’t have development experience, it might be a nightmare for you. Even though you may know how to write code in Salesforce, it is best practice to first try and see if you can conjure up a declarative solution. Here, we can use Lightning Flow and Screen Element to solve the above business requirement. Let us start by understanding the role of a Screen Element. A Screen Element allows you to take users’ input and process it – yes, one can write custom logic to process user entered data. That’s the power of Lightning Flow – as oppose to Lightning Process Builder that doesn’t have the capability to take user input and process it. New Flow – Use this button to create a Flow in the new Lightning Flow Designer. New Flow in Cloud Flow Designer – Use this button to create a Flow in the classic (old) Cloud Flow Designer. Now click on the New Flow button; it will open the Flow canvas for you. Once you’re done, Save the flow and name it Lead Form v1, with Type: Screen Flow. Do not forget to activate the Flow by clicking on the Activate button. Woohooo, you have just created a Flow using Lightning Flow Builder. I have added a link for each of the options – so that you can explore and learn more. Happy learning!!!! Note: – I am grateful to Resco.net and Skyvva for sponsoring my blog.